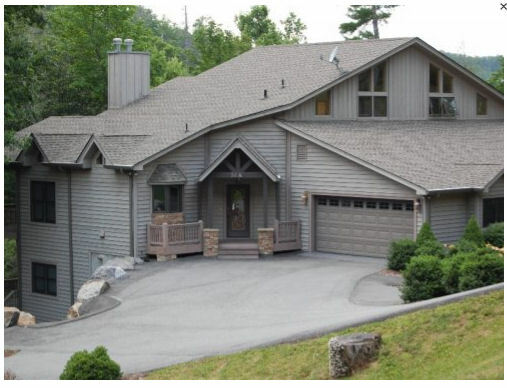 Bear Creek at Linville offers Luxury Living at Reduced Prices! When discussing real estate and Linville, North Carolina you will rarely hear the words "reduced prices" mentioned. However where else can you find the combination of luxury, private, gated living with more than 2600 sf of living space in a 3BR, 4BA home for under $350K? Bear Creek at Linville also offers beautiful one-acre-plus lots for as low at $89,900! If you have been waiting for amazing value, luxury and location - wait no more as we invite you to visit with to view some of the best available lots for sale in Linville as well as luxury homes, townhomes and more. Beautiful upgraded resale townhome. This home features upgraded lighting, upgraded stainless steel appliances including a down draft Jenn Aire oven/range, extra kitchen cabinetry to accommodate a small LCD TV for viewing from the kitchen/dining area, brushed nickel hardware, hardwood floors in living, dining and kitchen areas, up and down stairs and in rec. room on lower level. On the main level over the fireplace it is pre wired including the bracket for a 50″ plasma or LCD, and in the recreational room over the fireplace is a 50″ plasma HDTV with a Bose surround system included in the price of this home!! Two master bedrooms and bathrooms with whirlpool type tubs, upgraded brushed nickel fixtures, custom tiled showers, all bathrooms have adjustable 2 flush to toilets at comfort height. You have the laundry room on the main level and it has been upgraded with custom cabinets through out. In the loft there is a lot of windows to let plenty of natural light in and has its own bathroom. Two large shaded decks one on the upper level and lower level with steps going down to the common area with a creek behind this home. Two car over sized garage. The photography featured on this website is courtesy of Todd Bush at Bush Photo. Copyright ©2014 Bear Creek at Linville, All Rights Reserved.